Janata Dal is an Indian political party which was formed through the merger of Janata Party factions, the Lok Dal, Congress(S), and the Jan Morcha led by V. P. Singh on 11 October 1988 on the birth anniversary of Jayaprakash Narayan. The Janata Dal was formed on the 11 October 1988 at 1:18′ PM IST at Bangalore, India. the Rasi Chart is placed alongside. Capricorn rises (Lagna) showing its primary ideology centered around a poverty related theme of the upliftment of the poor and weaker sections of society. Rahu in the second house shows that its primary membership (family-2nd house) shall consist of people cutting across all religions and shall have a strong Minority/Muslim support. The tenth house shows the leadership and the tenth lord Venus in the 8th house shows that the leaders will be people who have sacrificed considerably and suffered many hardships in life. The Combination of Venus with Ketu and Saturn in trines does indicate that some of them shall be very determined and idealistic persons. 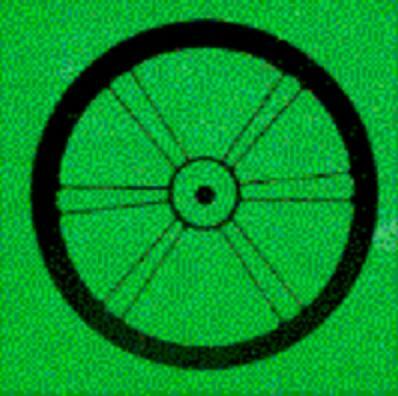 Since the expansive Jupiter is placed in the fifth house and also in the tenth house from Leo (Paka Lagna for the leaders), this party shall offer the maximum opportunity for its leaders to become Prime Ministers and it is a matter of fact that although the Janata Dal or its previous incarnation as Janata Party had the smallest tenures of governance, the largest number of Prime Ministers came from this party. he was upstaged by his deputy prime Minister Devi Lal who helped Chaudhary Charan Singh to gain power. and he too was upstaged by Chandrasekhar who became the Prime Minister. Finally H.D.Deve Gowda who was replaced by I.K.Gujral also became Prime Ministers. Their stints were short of about a year each as promised by Lagna Lord Saturn. Thus, it is evident that whenever Janata Dal/party came to power, the first Prime Minister was always replaced by another. This is indicated by the 8th house placement of the 10th Lord showing Duryoga within the period of power itself. The second leader is indicated by Mars and the coming of Mars will indicate the loss of power by the Party itself in the elections that would follow as Mars is very inimical to Saturn and has Papargala on it. This is further confirmed by the 8th house placement of the Mars and Moon in the Navamsa Chart. However the 8th house position does not auger well for their permanent association and since the A5 (Mantrapada) is also in Leo with Venus, these leadership maybe changed frequently. A slogan commonly used for the Janata Dal is “दल बदल बदल के दलदल कर दिया (dal badal badal ke dal dal kar diya)” i.e. by switching from one party to another and by forming so many subsidiary and affiliated parties, the entire political scenario of the JD has become very muddy (& dirty by implication). The ninth house placement of the Sun, Moon and Mercury is the greatest fortune of the party showing that alliances (7th Lord Moon) will always be very favorable (conjoins 9th Lord) for acquiring political power (Mercury in exaltation), but at the cost of the alliance partner (i.e. the alliance partner shall lose popularity like the weak Moon in this chart). The placement of the Moon in the 8th house under eclipse by Ketu and Mars in the Navamsa threatens the political existence of its partners in the places where it shall come to power with such alliances. The coming of power or rise in politics is seen from the fifth house and Lagna. Lagna Lord Saturn is in Sagittarius owned by Jupiter in the fifth house. Thus Jupiter holds the key to political ascendancy. ever since its inception, the antardasa of Jupiter has come only once from June 1995 to October 1997 during which period it enjoyed political power (excluding its prior incarnation as the Janata party). This party has had several splits. Amongst the larger splinter groups include the Rashtriya Janata Dal (which ruled the state of Bihar), Samajwadi Party (ruling the state of Uttar Pradesh), Biju Janata Dal (governing Odisha), Janata Dal (Secular) (which ruled the state of Karnataka) and the Janata Dal (United), (currently ruling Bihar and whose leader George Fernandes was the former Defense Minister of India) and Samajwadi Janta Party (R) headed by Chandra Shekhar is the only faction having some national image. Several smaller splinter groups also exist, including Lok Janshakti Party and Janata Party. The Janata Dal finally collapsed with multiple splinter groups moving out particularly the formation of JD(U) on 30 October 2003… in Rahu dasha Ketu antardasha. It was a typical Rahu-Ketu thing with the head separating from the body. 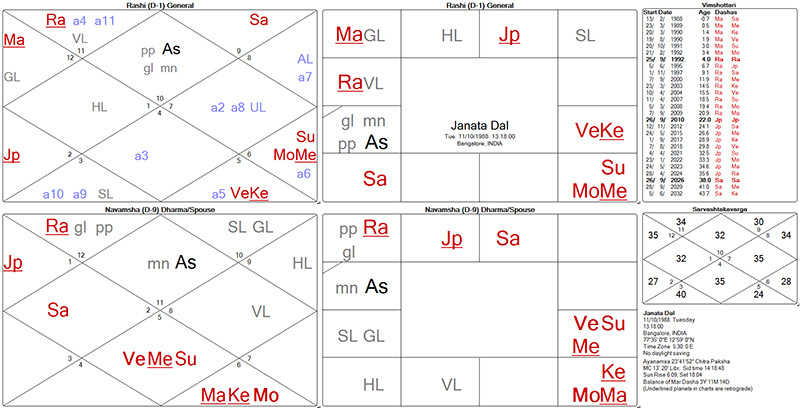 dear Guruji really interestings for Jupiter dasha cant give any success. Why we took 2nd leader as Mars? being 2nd from 10th house? Why is malefic influence of green sybolism here?